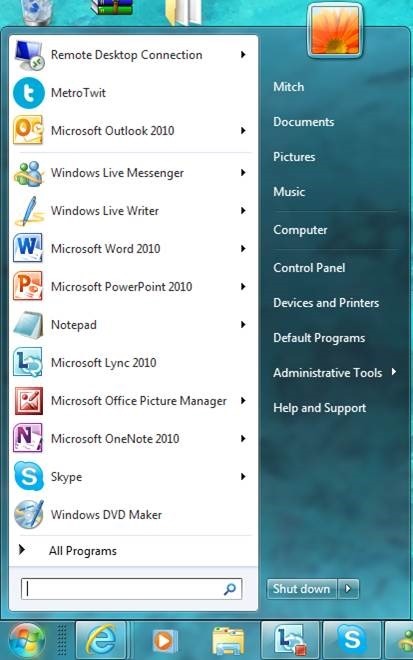 In my first two presentations on the new platform (at MVP Nation in Redmond, WA) I received numerous questions ranging from ‘Why did they do it’ to ‘How can I get it back?’ I have already come across two companies that have developed Legacy Start Menu applications or plug-ins for Windows 8. I for one will not be using them. In response to the questions in my sessions about why Microsoft changed the desktop, I have to reply that I do not have an answer, it was not my decision, and I was not consulted. However close I am to the program team, they do not share everything with me. With that being said, I want to put a little perspective to the discussion. The desktop as we know it – a graphical screen with icons and a mouse pointer – was invented by researchers at the Xerox Palo Alto Research Center in the late 1970s. While it has been improved upon and polished since, it has not changed a whole lot in over thirty years. 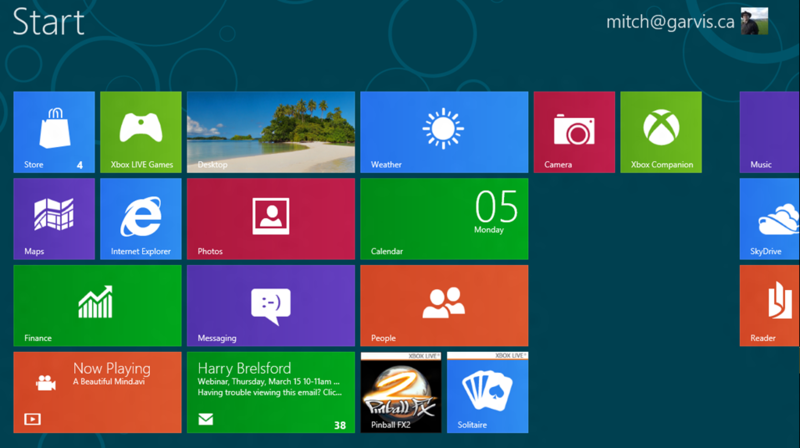 In fact, the Start Menu may be one of the biggest advances to it in that time. In the 1970s computers were very different than they are today, and the target market was a very miniscule subset of the people who currently use these devices. The fact that we have been using the design for this long means one thing: that we have gotten used to it, and not that they got it right in Palo Alto. I do not know how much time the engineers and developers and ‘idea people’ at Microsoft spent coming up with the new design; I do know that it must have been a more daunting task for them than it would have been for the original team, who had a blank slate, no expectations, and someone over drinks probably said ‘Hey, I wonder what would happen if I could use a box and a little joystick-like device to move things around on my computer screen?’ There were no preconceived notions to contend with. The truth is that Metro is the Start Menu… but more efficient. Icons have become tiles and everything is on your screen, easily scrolled. It could be argued that the old Start Menu was an inefficient use of space – your entire menu, no matter how you configure it, takes up 20% of your screen. It actually got better in Windows XP when the Start Menu got its second column, but if you are looking for something it is still only a small percentage of your screen. The new Metro Start Menu accomplishes the same task, but takes up your entire screen so that you can find what you are looking for more readily. It will just take people time to get used to it. When the settlers came to the New World their leaders burned their ships. In doing this they knew that they took the option of failure off the table – they had to succeed. To this day I still see the occasional Windows XP machine configured with the Classic Mode – Windows 2000 look. These people never had to get used to it, and are going to have even more of a shock when they have to go to Windows 8. For several years Microsoft Office Word had the option to use menus and keyboard shortcuts from WordPerfect 5.1. While it worked great for them in the short term, it was harder for them to transition to a later version without. The Ribbon Toolbar in Microsoft Office is another great example, and I was once told by a member of the product team that they tried to make a legacy mode, but weren’t able to make it work. I am okay with that, because as difficult as it was to learn the Ribbon, I am now glad that I did… and it did not take very long for me to realize how much easier it was than then drop-down menus I had been using since Office 95. The old is the old and the new is the new. I haven’t used an electric typewriter in years, and I don’t expect that cassette tapes are going to make a huge comeback. I do like managing my servers from the command line, but I expect I am in a minority, and am definitely glad I can use my remote MMC consoles for Server Core (and Hyper-V Server) when I want to. Is Metro going to last? I don’t know… but I have lived on the leading (and often bleeding) edge for so long that I am going to give it a fair try and see if I get used to it. I will say that the first time I installed it I was in the exact same training centre that I am in now, and I hated it… now? I may not love it yet, but I certainly don’t dislike it anymore. So for those of you who are complaining loudly about the missing Start Menu… Stop that! I’m just kidding of course, you are entitled to your opinions and some of them are even quite valid. However before you yell too loudly, see what the new is all about. You might end up liking it! Seems like the more things change (Win8), the more things stay the same (some people like to camplain). Maybe the latter would just like to continue using DOS? Or WIndows 3.1? Or Win95? Or Vista….We’ve been through this UI-changing-dilema before, and it’s not THAT onerous. Like you say, we’ll all get over it and we’ll all just get along. Henry, the great thing about a democracy is that everyone gets a vote. Of course, in a free society people also have the right to complain. Corporations (including Microsoft) are NOT democracies… just because you use a product does not give you a say in its design… although Microsoft does listen to their users, they will do what they feel is best. Most of the time they get that right. Perhaps picking up a WP7 device (HTC HD7) a year or so ago helped along with the ZuneHD I had before that. I like the Metro interface. I like Metro on the PC, laptop, and now the Tega v2. I think that the way you have explained it here is excellent. Most folks should be able to grasp this intellectually and practically.